I always wanted a little planter of grass on my desk so I decided to try a little indoor grass growing experiment to see how well it turns out. I'm hoping it can survive year after year with proper care. 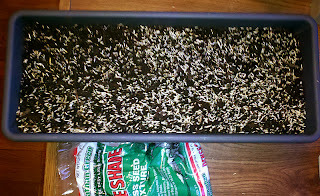 Instead of growing it in soil I'm using an organic potting mix and I'm using a grass seed I've had good results with in shade. I'm hoping it does equally well indoors. If you'd like to follow along with the progress of my indoor lawn I'll be posting it in the into the Grass Indoors section of my site. 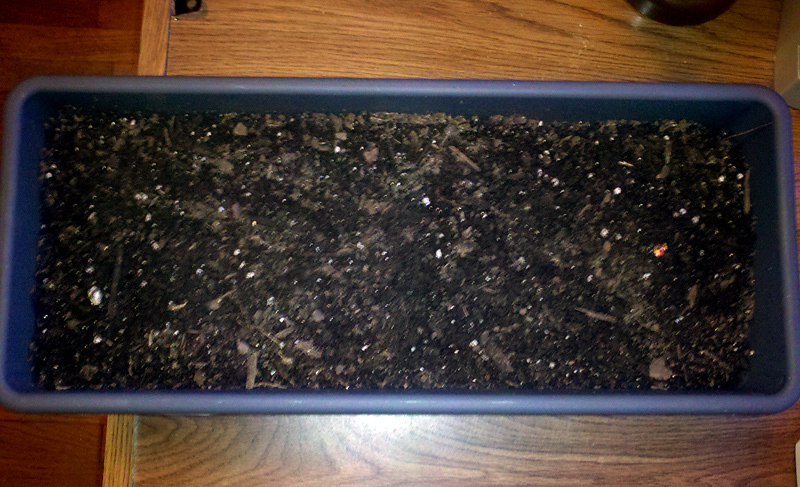 I'm using a small window sill planter that is 15.25" wide, 6.75" deep and 6.25" tall. It's not the most decorative of planters and it's a little taller than I wanted but it will work for now. If any of you happen to know where I can find a planter that looks like the one on the right but smaller please let me know! I filled the planter up to about 1" from the top with Jungle Growth Organic potting mix. There are many beneficial fungi in soil that help grass grow. I hope using a potting mix isn't going to cause any problems. I didn't really want to bring any dirt and bugs inside. 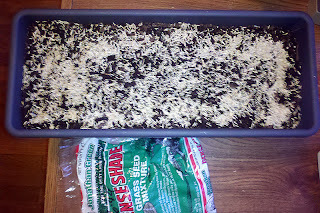 I'm using Jonathan Green Dense Shade Grass Seed Mix . It's a seed mix I use in a shady part of my lawn and have had great success with it. The bag I had was a few years so I added more than the recommended rate in case some of it has gone bad. I know at least some of it is good because I had to seed a patch of lawn earlier this year and the grass came up. 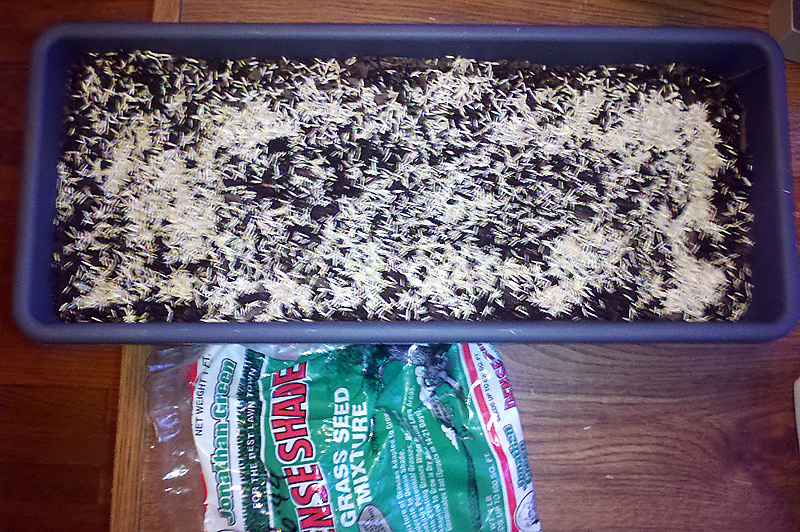 I used my hand to just gently work some of the seed into the soil and evenly distribute it along the top layer. 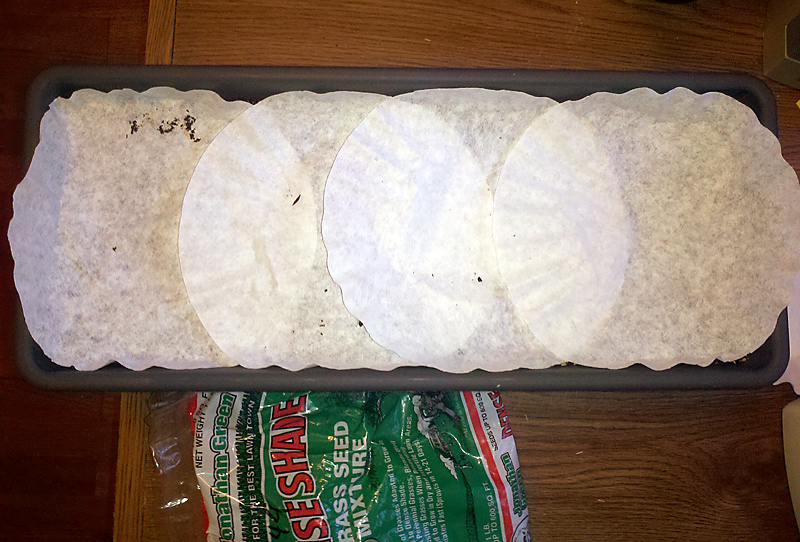 I placed a layer of regular white coffee filters over the seed and soil to act as a sort of seeding mulch. 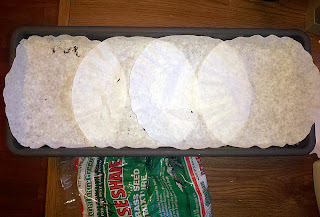 It will help keep the seeds moist and provide a better indication of when the seeds might need more water. 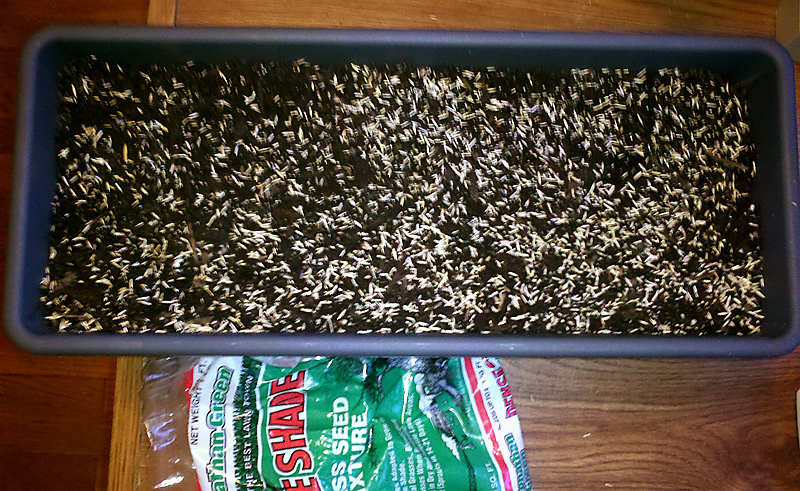 The final step was to water the seeds. I only added about a cup of water. 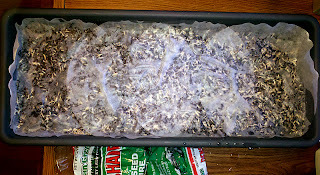 I'll be adding more water 2-3 times a day using a spray bottle to keep the seeds moist. 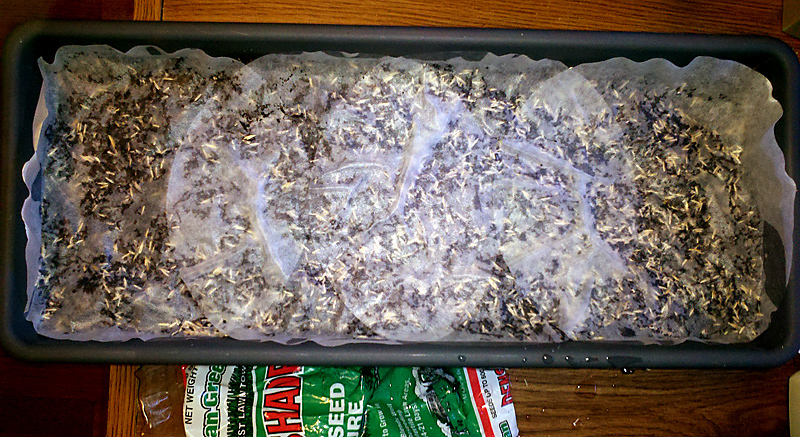 The age of the seed gives me some concern but I'm hoping it works out. Add my RSS feed to your reader to keep up with the progress. I am every excited to see the finish product! Hope you can update me the soonest. Its also good to know that what we tagged as "not that useful" indoor grasses like these can turn out as a very therapeutic activity to others who are looking for a hobby that are worth their time. Good idea! Do you have other suggestions on how we can transform these grasses into shape or figure? I know an ornamental plant that can be shaped into different sizes. I just forgot its name. But it is widely used as an indoor & outdoor decoration.